Collecting Evidence at the Car Accident Scene | Hupy and Abraham, S.C.
What Evidence Should You Gather at the Scene of Your Car Crash? What Should You Do After a Car Accident? What Should You Do After a Car Accident? Your health and safety—and the health and safety of everyone else involved in the crash—should be your first priority after an accident. There will be times when your injuries will be too significant for you to do anything other than wait for an ambulance at the scene of an accident, and that’s okay. However, some crashes result in less serious injuries and you may be able to collect important evidence at the accident scene that could later help your legal recovery. Information about all of the other drivers. This includes drivers’ license numbers, insurance policy numbers, license plate numbers, and contact information. What the other driver was doing at the time of—or shortly after—the accident. In many cases you won’t know what the driver was doing at the time of the crash. However, if you do notice the driver texting before the crash, smelling of alcohol after the crash, or doing something else that could have contributed to the crash, then it is important to take notice and write down what you remember. The road conditions. Sometimes road conditions can contribute to accidents. Take pictures of the accident scene so that you have the road conditions documented. Road signs. Take a picture of road and safety signs in the vicinity of the crash. Damaged vehicles and property. Take photos of the vehicles and any other damaged property that resulted from the crash. Whether there were any witnesses to the crash other than the people involved in the collision. You will want to get the names and contact information for these witnesses. Skid marks. Take pictures of the skid marks, if you are able to do so, as they may provide important evidence later. Debris in the road. Photos of all road debris that might have been caused by the accident or might have been present prior to the crash are important. Red light cameras, security cameras, or other cameras that might have recorded the accident. In some cases cameras may record your accident and be valuable evidence as you try to recover. 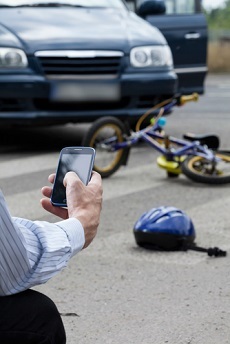 If you notice any at the accident scene, then write down their locations or take a picture of the camera. Whenever possible, take pictures from different angles and from varying distances. Try to capture both a general impression of the accident scene and particular details (especially of damage inflicted). For more information about what to do with this evidence and how to protect your rights after a car crash, please read our FREE book, The Ultimate Guide for Automobile Accident Victims, or contact us directly via this website today.